Couture Voltage designs unisex tees and tops, skirts, dresses, bags, and more! All of our designs are uniquely electronics-inspired with a special interest in synthesizer designs (knobs, wires, bread boards, circuit boards, schematics, and more!). We make clothes for everyone! I've always been a little fashionista and a little Ms. Frizzle. While traveling with Delptronics to various music events, trade shows, and conventions - I decided I wanted to stand out a little in a fun way. 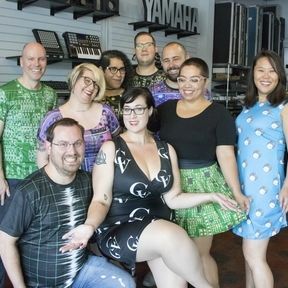 I started designing synthesizer-inspired designs for outfits over 3 years ago, the first debuting at Knobcon in Chicago. Ever since, I've been making new designs every year for myself and Delptronics to wear at places like Moogfest, NAMM, SXSW, Maker Faire, and a dozen more events throughout the year. The interest in the one-of-a-kind items made me feel like it was time to let everyone share in the fun - and Couture Voltage was born!